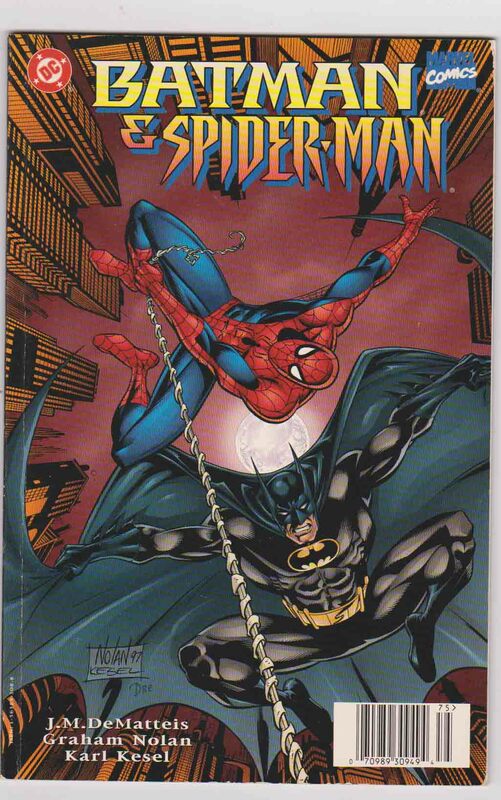 Batman / Spider-Man #1 (1997) Graham Nolan Cover & Pencils, John Marc (J.M.) DeMatteis Story, Batman Spider-Man Crossover "New Age Dawning" Listed as being one of the stories that happened on Crossover Earth in the online companion to the All New Official Handbook of the Marvel Universe (2006) The Kingpin's wife lies deathly ill, and Ra's al Ghul offers a solution: the ailing Mrs. Fisk can bathe in the Lazarus Pit and be restored, but only if the Kingpin helps Ra's kill off 99.5% of the world's population. Only the Dark Knight and the Wall-crawler have any hope of thwarting the uneasy alliance in this globe-spanning adventure. Written by J.M. DeMatteis. Art and cover by Graham Nolan and Karl Kesel.